The New Deal Festival is famous for it’s delicious food. 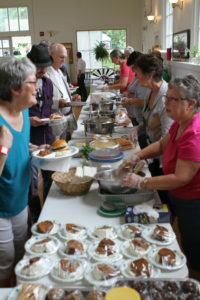 Our wonderful volunteers make sure plenty of yummy food is available all day long and that drinks are stocked ice cold. You can get BBQ pulled pork, hamburgers, hot dogs, snacks, ice cream, and homemade desserts. You will not leave hungry!